If you liked Volume 1, then you’re going to like Volume 2 even more! 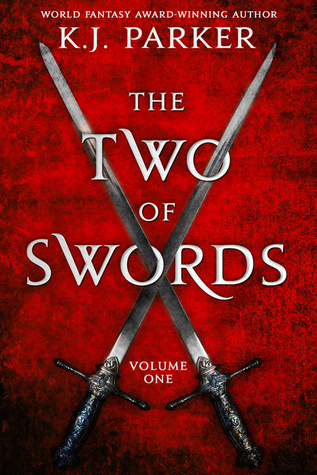 **The Two of Sword series was originally a serial novella series from 2015 through the end 2017, with a single novella coming out each month. There were 19 parts in total, and upon collection, they were broken up into a 3 volume set. 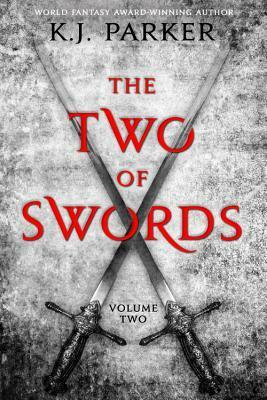 The Two of Swords, Volume 2 contains the novellas 9 to 15. Except for the move that was made by Emperor Glauca before: the deal for the Silver Pack. Again, I can’t go more into the plot, because each novella is a different character, and with each character comes a different plot. However, I will say that we do start off with Telamon and then Oida as our first two POVs, and while there isn’t an exact timeline given, I would guess that it takes place roughly several months after the end events of Volume 1. Including Oida, I believe we had 6 new POV characters! Yeah, so that brings the total up to 13 now? And as last time, the story continues in a linear, not a second missed, being handed off from character to character, fashion. In my opinion, it just as if not more impressive than last time because of the fact that he has still be able to do it effectively for all this time. The only exception to this skipping or more than a few seconds between novellas, was to start this Volume (but I believe that was done to both give to the reader a sense of complete with the first book, and to help progress the plot). My only criticism come down to the same two elements again: lack of recurring POV characters and pacing. Of those 6 new POV characters, 3 off them right off the bat, I was very stubborn to give in to. One them, a young man named “Chantant mi Chanso, actually became my favorite character this time, while another man (whose novella I gave the 3.5 Rating too), I never grew to enjoy and the “slow moments” of his plot felt far slower and persistent than any other. That brings to my only other criticism: the pacing. This is just the way Parker writes. At times it feels like I am reading a history. Sometimes I am 100% into that, and other times I just skim those bits of world-building to get back to the plot. Outside of that one novella though, I personally felt that those times of lull were much sparse than previously. The last thing I was want to mention is how amazing this plot it. First, with this book we finally get to see what going on in the The Lodge! (kind of..) And the one thing I kept wonder, while I was loving where this story was going and was constantly being hit surprises… I had no idea where it was going! I was starting worried about how Parker was going to wrap thing up, because I didn’t even know what direction to look in for the end game. It wasn’t until the last part of the last novella that Parker flipped his card and showed us where this story is going 😉 I can’t wait to see how he’s going to do it, with only 8 novella left. If you liked Volume 1, then you’re going to like Volume 2 even more! The good parts get better, and the minor annoyance subside greatly! If you weren’t feeling Volume 1 – wether it be because of Parker’s writing style or the plot – look at what I had to say again, and depending on your reasoning, you may want to continue on. So there is one more book coming? Such a cool idea to break down novellas like that. I really need to read some Parker! The third is already out; they all go released at the same time. But the other novel I’ve by him is The Folding Knife, which I loved, I know a lot of people seem to say Sharps is his best work.